To Cite: Zahedi Bialvaei A, Asgharzadeh M, Aghazadeh M, Nourazarian M, Samadi Kafil H. Challenges of Tuberculosis in Iran, Jundishapur J Microbiol. 2017 ; 10(3):e37866. doi: 10.5812/jjm.37866. Background: Despite the implementation of the national control program, tuberculosis is one of the greatest health problems in Iran. The prevalence of different strains in specific ethnic populations suggests that Mycobacterium tuberculosis transmission has been limited and restricted to close contact. Objectives: In the present review, we describe the epidemiology of tuberculosis in Iran. Methods: In this review article, databases including Scopus, PubMed, and Google scholar were used to search for the epidemiology of tuberculosis in Iran. Results: Since 1996, tuberculosis incidence has been decreased as the national tuberculosis control program was established in Iran. However, due to the emergence of drug-resistant strains, recurrence of the disease, and association of tuberculosis with HIV pandemic, tuberculosis is becoming a health problem in Iran like many other parts of the world. Moreover, several other factors such as poverty, homelessness, inadequate access to health services, and lack of infrastructure in public health play an important role in worsening the situation. The distribution of the disease is not similar in all parts of Iran and it is higher in the western and eastern parts than the central areas. Conclusions: Review of the studies revealed that levels of multidrug-resistant tuberculosis among new tuberculosis patients are increasing in Iran and the vaccination system needs to be reformed. Because of the increasing number of patients coming from neighboring countries with multidrug-resistant tuberculosis, this area needs more stewardship and control in order to prevent the outbreak of multidrug-resistant tuberculosis. Finally, by improving the healthcare system, it is trusted that a more noteworthy number of these patients will be cured in Iran. Tuberculosis has claimed its victims throughout the history. Tuberculosis’s notoriety as one of the the most important bacterial terrors of humanity alongside typhoid, typhus, plague, cholera, and diphtheria has led to descriptors such as “the captain of all those men of death” and “great white plague”. More than a decade after the declaration of world health organization (WHO) about the global health emergency of tuberculosis, it is still a major health concern worldwide (1). Tuberculosis occurs in every nation all around the world; but, the most noteworthy frequency is found in Africa and Asia, while lately, it has re-emerged as a major public health issue in Russia and other eastern European nations (2). Considering the importance of tuberculosis, especially in developing countries such as Iran with a large number of Afghan immigrants, changes in age range, and growing population, it is necessary to acquire comprehensive information about this disease in order to adopt appropriate control strategies and achieve WHO’s goals. This type of information may include drug resistance, outbreak rate, underlying factors such as smoking and diabetes, socio-cultural factors, and mortality rate. Other factors that play an important function in the spread of tuberculosis are age, male gender, homelessness, immigration, asthma, smoking, family history of close contact with tuberculosis or human immunodeficiency virus (HIV) patients, making the outbreak of tuberculosis more likely in the impoverished provinces. We believe that the present review can provide comprehensive information regarding the epidemiology of Mycobacterium tuberculosis infection in Islamic Republic of Iran. 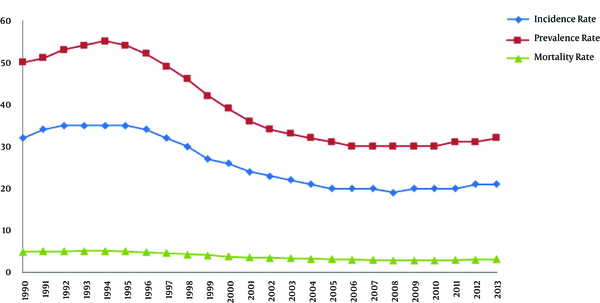 In the present study, we describe the epidemiology of tuberculosis in Iran. In this review article, Scopus, Pubmed, and Google scholar databases were used to study the epidemiology of tuberculosis in Iran. In the literature review process, Scopus, Pubmed, and Google scholar databases were searched to study the epidemiology of tuberculosis, drug resistance, molecular epidemiology, multidrug-resistant tuberculosis, and HIV/tuberculosis co-infection in Iran. With close attention to the fact that tuberculosis is still one of the biggest killers among the infectious diseases, Iran, like other countries of the world, uses a live attenuated vaccine [Bacille Calmette-Guerin (BCG)] and several antibiotics, which are essential to gain better understanding of the pathogenicity and virulence factors of M. tuberculosis (3). Due to the introduction of vaccination program in 1988 to immunize all children at birth, the incidence of tuberculosis in Iran reduced from 20,308 cases in 1990 to 15,545 cases in 2006 as well as the mortality rate declined from 2,358 cases to 1,839 cases per year. In addition, a comprehensive review has been conducted in Iran on directly observed therapy short-course (DOTS) program, and surveillance and laboratory quality assurance involving healthcare providers for controlling tuberculosis have been strengthened as well (4). The aim of this program is to be ascertained of patients’ adherence to therapy by observing them to swallow each dose of medication (5). However, one important problem in carrying out the DOTS strategy by healthcare workers is the inconvenience of the patients in terms of obtaining the drugs from a health center frequently a week. Therefore, the performance of this strategy under the control of family members could be an alternative (5). The distribution of tuberculosis is not uniform; the incidence and prevalence of the disease are higher in the regions near the borderlines and lower in the central parts of the country (Figure 1). 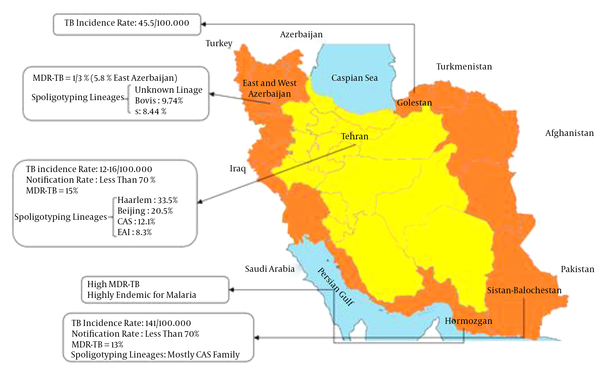 The borderline areas of Iran including the provinces of Sistan and Baluchestan, Golestan, Khorasan, East Azerbaijan, West Azerbaijan, and Kurdistan are endemic regions by giving 10% - 13% multidrug-resistant isolates among 141 TB cases per 100,000 (6). Highlighted areas on the country borderlines show a higher prevalence rate. It is currently estimated that over 2 billion people worldwide are exposed to M. tuberculosis, with over 8.7 million new infections in 2012, leading to 2.5 to 3 million cases of mortality per year; this makes tuberculosis the foremost cause of death by infection (7). In Asia, it is not exactly known when tuberculosis initially spread. However, the prevalence of the disease in the continent was high until the end of the nineteenth century which remains so today. According to WHO’s statistics in 2008, most of tuberculosis cases (34.1%) occurred in the south-east of Asia, leading to the death of about 1.3 million cases (8). Based on another report by WHO, in 2011, Iran had a lower incidence of tuberculosis (21 per 100,000 population) than all the neighboring countries (Turkey: 24 per 100,000, Iraq: 45 per 100,000, Armenia: 55 per 100,000, Azerbaijan: 113 per 100,000, Afghanistan: 189 per 100,000, and Pakistan: 231 per 100,000) (Figure 2) (9). Rates are per 100,000 population. Across the world, tuberculosis is more common among men than women and happens more often in the adults with difficult occupations. In 2012, about 3 million out of 8.6 million cases of tuberculosis were women and 530,000 were under 15 year old children (10). According to Iranian studies, tuberculosis prevalence is also higher among males than females. This phenomenon may be due to the fact that men are more active in the community and more exposed to the carriers and risk factors of the disease such as cigarettes and narcotic substances. In the WHO’s report in 2013, the male to female ratio was 1.1 in Iran (11). In the north of Iran, the incidence of tuberculosis is 1.6 times higher in men than women (10). Also, in Bandar Abbas (a southern city in Iran), pulmonary tuberculosis has been 2.5 times higher in men than women. In Kashan (a central city in Iran), 50.3% of the disease prevalence is seen among women. However, in Yazd, 53%; in Shiraz, 63%; in Zabol, 64%, and in Abadan 55% of cases have been observed among men (12). By the introduction of molecular epidemiological typing methods, described in the following, M. tuberculosis-related strains have been identified and characterized. Therefore, they are categorized in seven potential families, clades, or lineages, including Haarlem, Latin-American and Mediterranean (LAM), East-African-Indian, Beijing, X, T, and Central Asian families (13). One of the most important families is the Beijing family, in which the spread of drug-resistant tuberculosis is associated with the expansion of strains belonging to the family (14). Although the T family is the most frequent genotype among Iranian tuberculosis cases (15), recent studies have shown that Beijing, Central Asian, and Haarlem genotypes are overrepresented among multidrug-resistant tuberculosis cases in the country (16, 17). However, because of low case notification rate and preferred migration of Afghan individuals to particular parts of Iran, it is not clear whether this genotype has been imported to the country after the massive migration of Afghans or it has been one of the circulating genotypes of M. tuberculosis in Iran (18). Geographically, Iran is located in the south-west of Asia with the total land boundaries of 5,440 km. Iran has the population of 78 million and shares geographic borders with three countries in which, tuberculosis is endemic: Afghanistan, Iraq, and Pakistan. In addition, Iran is in a close association with other countries where tuberculosis is highly prevalent, i.e. China, India, Nepal, Bosnia, Bangladesh, Tajikistan, Sri Lanka, and Azerbaijan. Iran’s Ministry of Health, along with some charities, has provided patients with free-of-charge treatments, which can be an explanation for the vast number of tuberculosis-affected individuals in the area, because a number of refugees enter the country to benefit from such free treatment (19). During the past two decades, immigrants from neighboring countries have flooded to Iran. UN Refugee Agency stated that at the end of 2005, Iran had been the host of the third largest refugee populations in the world, with the total of 716,000 refugees (http://www.migrationinformation.org). Recently, investigators have demonstrated intra-community transmission as the circulating strain of M. tuberculosis in different countries (20, 21). Generally, molecular epidemiology shows the predominance of certain families of M. tuberculosis in specific locations. 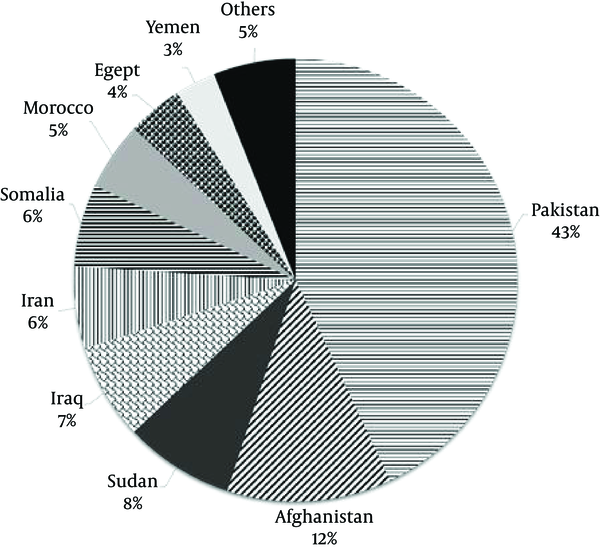 In 2002, the number of affected patients per annum in the eastern Mediterranean region was reported as 630,000, with 136,000 annual deaths, among whom 43% were from Pakistan, 12% from Afghanistan, and 6% from Iran (Figure 3) (22). One of the most important immigrant populations in Iran is from Afghanistan. For example, the approximate number of recorded Afghan immigrants in Fars province (south of the country) is 200,000. However, because most of these immigrants are not recorded, this number seems to be less than the half of the real number of these immigrants, comprising a flowing population with low income (18). Most Afghans who migrate to Iran are men leaving their families in Afghanistan to come to Iran to look for a job. The average three years incidence of tuberculosis among the Afghan immigrants in Fars province was 82.6 per 100,000 populations, while according to the data from Ministry of Health; the incidence of tuberculosis among the Iranian population of Fars Province from 2000 to 2002 was 5.2 per 100,000, i.e. 16 times less than that among Afghans (22). Afghan patients include more than half of the multidrug-resistant tuberculosis cases in Iran, which reflects insufficient health services and surveillance infrastructure in their country (23). In a survey conducted by Farnia et al. the rate of reactivation versus recent transmission was evaluated among Afghan and Iranian relapse cases and the impact of Afghan immigrants on the national tuberculosis control program of Iran due to intra-community transmission between Afghan and Iranian tuberculosis cases was highlighted (24). Based on a report by WHO, Republic of Azerbaijan is another country with a high tuberculosis incidence and multidrug-resistant tuberculosis burden (11). Azeri patients travel to the northwest of Iran for tuberculosis treatment (25). Because of the increasing number of patients referring from Republic of Azerbaijan to the region with multidrug-resistant tuberculosis, there is a need for more stewardship and control of these patients in order to prevent the outbreak of multidrug-resistant tuberculosis in the region (25, 26). This finding supports the proposal for a policy to screen all immigrants to Iran for tuberculosis, especially those from tuberculosis high-burden countries such as Azerbaijan, Pakistan, and Afghanistan. Therefore, positive patients would be subjected to anti-tuberculosis treatment before being allowed into the country (27). The treatment policy of tuberculosis in Iran involves the administration of isoniazid, rifampicin, pyrazinamide, and ethambutol for the first 2 months and administration of isoniazid and rifampicin for the next 4 months (28). For the treatment of multidrug-resistant disease in Iran, National Tuberculosis Program recommends a combination of kanamycin or amikacin, ethionamide, pyrazinamide, ofloxacin, and ethambutol or cycloserine in the initial phase, followed by ethionamide, ofloxacin, and ethambutol or cycloserine in the continuation phase for 18 months (29). However, some private practitioners in Tehran do not comply with these recommendations and the results of susceptibility testing are not always being used for selecting suitable second-line drugs (30). Rifampicin has been found to be an effective anti-tuberculosis agent and its utilization has incredibly shortened the span of chemotherapy for the treatment of tuberculosis (31). It has also been demonstrated that the patients infected with rifampicin resistant strains will encounter a higher failure rate with short-course 6-month chemotherapy (32). These patients require treatment for at least two years while the treatment is 70 times more costly accompanied by much higher mortality rate (about 40% - 60%) (23). In different parts of the world, multiple types of mutations have been identified in rifampicin-resistant M. tuberculosis clinical isolates, most of which are 10 codon point mutations, while only a few isolates have insertion or deletion. Most frequently involved codons in mutation have been codons 526 and 531 in various parts of the world (33, 34). The mutation in rpoB gene, which encodes the “beta” subunit of RNA polymerase, is almost exclusively associated with resistance to rifampicin (35). This mutation can be found in 96.1% of rifampicin resistant M. tuberculosis isolates and occurs in rifampicin resistance-determining region with 81-bp lengths corresponding to 507 - 533 amino acid residues (35). In an Iranian report, it was demonstrated that 28% of isolates were rifampicin resistant, which was still lower compared to many areas in Africa and Europe (51.9% - 68.9%) (36), while in the United States, about 13% of isolates from new tuberculosis cases have been resistant to one or more of the first-line anti-tuberculosis drugs and 1.6% of cases are resistant to both isoniazid and rifampicin, defined as multidrug-resistant tuberculosis (37). Although multidrug-resistant tuberculosis in the re-treatment patients varies from 30% to 80% in different regions of the world (38), a study in Iran showed a notable success in the treatment of multidrug-resistant tuberculosis (39). In the same report, bacteriological cure occurred in 76.5% of the patients who were resistant to rifampicin and isoniazid (Table 1). Abbreviations: EMB, ethambutol; INH, isoniazid; ND, not defined; RIF, rifampin; SM, streptomycin. In the studies conducted in Iranian settings, drug resistance to streptomycin has been found to have the highest proportion among anti-tuberculosis drugs, followed by isoniazid with 23% resistance in new cases of tuberculosis (23, 40, 41). The high prevalence of streptomycin resistance isolates may be due to the previous usage of other aminoglycosidal drugs for the treatment of different infectious diseases, like brucellosis, which can result in cross-resistance (23). This high rate of streptomycin resistance has very important implications for tuberculosis control strategies since it would make treatment regimens less effective (40). Isoniazid, one of the main agents in tuberculosis treatment, is a pro-drug that, via passive diffusion, enters the bacteria by enzyme catalase-peroxidase changes into an active form and paves the way for attacking several targets in the microorganism by free radicals. The previous observations have shown that after being exposed to isoniazid, tuberculosis bacillus loses its acid fastness property (42). The development of isoniazid resistance usually precedes resistance to rifampicin; therefore, resistance to isoniazid is considered a surrogate marker for multidrug-resistant tuberculosis (43). The increasing resistance to isoniazid is an alarming sign, which demonstrates further transmission of resistant strains in the community. Resistance to isoniazid is associated with a variety of mutations in several genes such as inhA, KatG, kasA, oxyR-aphC, and ndh (44). Mutation in katG gene is the primary mechanism of isoniazid-resistance in many strains (45). KatG gene encodes protein catalase-peroxidase and mutation in this gene blocks or decreases the chemical activity. The frequency of primary drug resistance to isoniazid was 9.8% - 15% in a recent study (46). Also, in a report from the eastern region of Iran as well as in another study carried out in Isfahan and Tehran provinces, isoniazid-resistant M. tuberculosis isolates contained mutations in KatG gene with the mutation rate of 61%, 78%, and 61%, respectively (47, 48). The huge increment of isoniazid resistance in the last few years displays a vital need for the quick identification and effective management of isoniazid-resistant tuberculosis in Iran. Pyrazinamide is also an imperative first-line medication utilized for the short-course treatment of tuberculosis in combination with isoniazid and rifampicin (49), because it is bactericidal to semi-dormant mycobacteria that are persistent in acidic-pH environments inside macrophages and not influenced by other anti-tuberculosis drugs (50). Due to the global emergence of multidrug-resistant tuberculosis, the rates of resistance to pyrazinamide are also growing (51). Drug resistance of M. tuberculosis was perceived soon after the presentation of effective anti-tuberculosis agents in the late 1940s (52). Based on a nation-wide survey carried out in 1999, 10.9% of all the M. tuberculosis isolates tested for drug susceptibility were resistant to ≥ 1 anti-tuberculosis drug and 6.7% were resistant to both isoniazid and rifampicin (i.e. were multidrug-resistant strains of M. tuberculosis) (53). According to available data, the proportion of multidrug-resistant isolates in new tuberculosis patients is increasing in Iran, and about 3.7% of such cases are estimated to be multidrug-resistant strains (7). These isolates are considered as an emerging problem in many parts of the world. However, the epidemiology, prevalence, genetic diversity of multidrug-resistant tuberculosis genes, and mutations conferring drug resistance vary across Iran. A report published in 2000 showed that the primary resistance to a number of drugs became more frequent; the most resistance rate was against streptomycin, followed by ethambutol, and isoniazid (41). These characteristics were also confirmed by the results of a study from Turkey, in which the highest resistance was found against streptomycin (54). Previous inadequate treatment is an important prognostic factor in the increase of multidrug-resistant tuberculosis in Iran. Most of the patients had been taking irregular anti-tuberculosis drugs for a long time, leading to failure in treatment (55). However, among the new patients diagnosed with tuberculosis, 5% normally have multidrug-resistant tuberculosis, which is an emerging problem of great importance to the public health of Iran. These isolates, resistant to both isoniazid and rifampicin with or without resistance to other drugs, have caused concerns worldwide due to high mortality (56). Such cases are difficult to cure, requiring the use of second line drugs that are more expensive and poisonous than the first line regimens. It has also been demonstrated that individuals who have primary resistance and frequently experience failed treatment may become gradually more resistant and hard to cure (57). In this way, it is imperative to determine the distribution of resistance mutations at the level of every nation prior to molecular tests being presented for routine diagnostics (58). A study from Iranian national research institute of tuberculosis and lung disease on drug resistance patterns of tuberculosis from 2003 to 2008 has shown that 2% of M. tuberculosis isolates from new cases were multidrug-resistant (59). Also, in a recent survey, 41 (16.3%) of 252 M. tuberculosis isolates collected from the patients of different parts of Iran, including five provinces, were resistant to at least one anti-tuberculosis drugs (40). This study indicated lower drug resistance rates in Iran than the studies conducted in Turkey, Iraq, and Pakistan with the drug resistance rates of 21.1%, 29.7%, and 64% respectively (15, 60). Recently, M. tuberculosis strains that are Extra-drug-resistant, i.e. they are tuberculosis strains resistant to at least three of the six classes of second-line drugs (para-aminosalicylic acid, fluoroquinolones, polypeptides, thioamides, aminoglycosides, and cycloserine), have been reviewed in Iran (61). However, at present, the number of Extra-drug-resistant tuberculosis cases in the nation is still low; but, the higher rate of tuberculosis cases comprising Multi drug resistant tuberculosis in the neighboring nations such as Pakistan, Afghanistan, and the countries of the former Soviet Union, underlying the probability that almost the same cases also exist in these countries (61). Continuous surveillance of the primary and acquired drug-resistance patterns of M. tuberculosis to assess the efficacy of the past chemotherapy regimens is important as the same as detecting errors in past treatments (62, 63). However, the absence of a comprehensive surveillance network and inadequacy of reliable prevalence studies in Iran make it difficult to evaluate the true extent of multidrug-resistant tuberculosis in the country (56). The present worldwide tuberculosis control paradigm mostly focuses on cutting transmission via primary case detection and effective therapy, while medical interventions are at the core of the global plan (64). According to the WHO’s report in 2006, it takes about 126 days in Iran to identify and treat smear positive pulmonary tuberculosis, and the diagnosis process is the most time consuming issue (Figure 4) (65). Fast and accurate diagnosis of tuberculosis plays an important role in preventing the transmission and mortality. Data have shown a significant relationship between delay in diagnosis and treatment of tuberculosis in prisons, which causes more transmission and mortality in patients in prisons compared to ordinary people (10). Tuberculin skin test (TST) with purified protein derivative (PPD) as one of the cell-mediated immunity (CMI)-based tests has low specificity in the detection of tuberculosis infection (66). However, the ratio of positive purified protein derivative tests to number of patients who are tested in the studies is about 50% (10, 67). In addition, in HIV-positive patients, the sensitivity of tuberculin skin test decreases (68). Thus, in screening and detecting tuberculosis, a new diagnostic test based on specific antigens would be of great value. Moreover, most tuberculosis epidemiological studies, including tuberculin surveys, have been performed over limited geographical regions. The accessibility of the completely sequenced genome of M. tuberculosis has provided tools to detect bacterial antigens that are useful in the development of new reagents for tuberculosis diagnosis and controlling (66). In Iran, tuberculosis surveillance is based on the conventional methods that have limited practical values. These methods consist of colony characteristics, growth temperature, and biochemical tests. These methods are widely used to identify mycobacteria isolates although they are labor-intensive and time-consuming and may sometimes remain inconclusive. These methods also cannot distinguish between new and old infections and cannot detect the source and route of infection. This issue is vital for diminishing tuberculosis, while determining the varieties of tuberculosis strains can be accomplished by DNA fingerprinting (69). At present, the challenge is to compile standardized molecular fingerprinting patterns originating from multi-centric, highly networked, and genotypic analysis in the databases for inter-laboratory utilization as well as for further references (70). The technique most commonly employed in the molecular epidemiology of tuberculosis is strain typing by restriction fragment length polymorphism (RFLP), which is a technique based on the detection of differences in the numbers and locations of the insertion element IS6110 inside of the chromosomes of M. tuberculosis strains. However, this insertion element has low, but obvious, frequency of transposition so that RFLP patterns demonstrate a certain amount of instability (71). Overall, RFLP typing has more discriminatory power and is a valuable instrument for better comprehension of transmission and occurrence of micro-epidemics and source tracing (69). A study from the northwest of Iran showed high average copy number of IS6110 per isolate, confirming the usefulness of this method for epidemiological studies without the necessity of using additional genetic markers (72). Finally, IS6110 fingerprinting is additionally restricted by the slow growth of M. tuberculosis because a viable culture is required to produce an accurate genotype. Subsequently, a few other genotyping methods have been developed, including variable-number tandem repeat typing (VNTR) (73), polymorphic GC-rich repetitive sequence typing (PGRS) (74), spacer oligonucleotide typing (spoligotyping) (75), and mycobacterial interspersed repetitive units typing (MIRU) (76). Comprehensive evaluation of the methods of genotyping M. tuberculosis has been clearly described in several studies; therefore, these techniques are not discussed in the present review. Despite the adoption of DOTS strategy by WHO, tuberculosis prevalence continues to increase globally, particularly in developing countries (69), which has been attributed to the emergence of drug-resistant tuberculosis and HIV pandemic (1). These two infections have a synergistic effect on each other. HIV infection, particularly advanced HIV infection (AIDS), is more critical than any other risk factors for the disease progression of recent or remotely acquired tuberculosis infection, both of which are major public health concern in numerous parts of the globe (23). Similarly, HIV infection is one of the most important risk factors promoting progression of latent tuberculosis infection to active tuberculosis disease in people with M. tuberculosis infection (77). About ten million individuals are estimated to be co-infected with M. tuberculosis/HIV, and more than 90% of these infected people reside in developing countries (78). Among the patients with AIDS, tuberculosis kills one out of every three people. Before emerging highly active antiretroviral therapy, among the people co-infected with M. tuberculosis and HIV, the estimated risk of active tuberculosis relative to the patients with no other known risk factors for active tuberculosis was 113.0 times greater for HIV infection without AIDS and 170.0 times greater for AIDS (79). During the course of HIV infection, tuberculosis is the most important opportunistic infection that can happen at any point (80). Moreover, HIV-positive patients have high risk of transformation of latent tuberculosis into the active form, which makes patients more vulnerable to the development of adverse drug reactions (80). Compared with HIV-negative population, the clinical picture of tuberculosis is somewhat diverse in this group especially in the advanced phases of infection, which is shown as atypical radiologic findings such as mediastinal lymphadenopathy, pleural effusion, miliary pattern, and high incidence of extra pulmonary involvement (81). There are many drug users in the country, including occasional users, mostly of opium; “but, intravenous heroin utilization is on the rise”. In addition, there are more than 10,000 HIV-positive individuals. A study carried out in 2002 showed that 11.4% of HIV-positive patients in Kermanshah Province were with tuberculosis (81). A multi-centric study evaluating the frequency of M. tuberculosis infection in the infected patients with HIV from Tehran in 2008 showed that almost 24% of patients with HIV/AIDS were also infected with M. tuberculosis (79). In another study from Khuzestan province in 2012, this rate was determined as 26% using PCR technique (82). These findings represent the requirement for preventive and diagnostic measures as well as prompt treatment of this type of infection in the HIV-infected patients. The reported rate from India, a country with heavy load of AIDS, is 38.5% (83). The HIV prevalence in incident tuberculosis cases was reported to be 2.2% and the tuberculosis incidence and mortality among HIV-infected patients was less than 1% in this country (84). In spite of the fact that the reported tuberculosis incidence rate in Iran has decreased during the last recent decades, tuberculosis control remains a need among public health policies. In the present review, the gathered data showed that a high proportion of tuberculosis cases are sensitive to antibiotics. However, to avoid the emergence of multidrug-resistant tuberculosis and to provide optimal treatment, susceptibility testing for all new cases is strongly recommended. In spite of the fact that anti-tuberculosis drug resistance is present in Iran, multidrug-resistant tuberculosis is considered to be prevalent. In addition, by enhancing the surgery system and increasing the number of multidrug-resistant tuberculosis patients qualified for surgery, it is hoped that a greater number of suspected patients will be cured in the country. The results of several studies on the distribution pattern of strains in a few ethnic populaces have clarified the mechanism of transmission and factors related to the disease transmission (85, 86). The data gathered in the present review will help us comprehend the dynamics of M. tuberculosis strains among different ethnic populations and geographic regions in Iran. Taken together, many studies have suggested that M. tuberculosis transmission is limited and restricted to close contact. Also, some genetic evolutions of M. tuberculosis which are in correlation with historic events remain to be investigated. Developing programs to evaluate the conditions needed for screening the incidence and outbreaks of tuberculosis in different regions all over the country are recommended to identify the regions with high risk and performing precautionary measures, severely and precisely. Thus, it is important to consider the identification of tuberculosis, particularly in groups at risk, by early diagnosis in order to decrease the expense of the current methods, enhance the effectiveness of treatment, encourage preventive measures by using DOTS strategy, improved restriction of the entrance of opium drugs especially from the neighbor country Afghanistan, improved economic situation, and applying strict control on immigration and resolving social problems. Also, in order to prevent the transmission of drug-resistant tuberculosis from neighboring countries, new tuberculosis centers should be established near the borderlines to prohibit the travelling of patients and their long-term attendance. We thank the staff of Tabriz and Urmia tuberculosis central laboratories for their generous cooperation. This study was supported by the Iran national science foundation for tuberculosis in human and cattle in Northwest of Iran (grant 843599). Authors’ Contribution: Abed Zahedi Bialvaei carried out the data collection and drafted the manuscript. Hossein Samadi Kafil participated in designing the study and drafting the manuscript. Mohammad Asgharzadeh participated in the design of the study. Manouchehr Nourazarian and Mohammad Aghazadeh participated in drafting the manuscript. All authors read and approved the final manuscript. Conflict of Interest: We declare no conflict of interest for the authors of the present study. Funding/Support: This study was granted by drug applied research center, Tabriz University of Medical Sciences, for a research project entitled “Tuberculosis status in Iran”.